Beauty On the Cheap- Argan Oil and L'oreal for 1.99! 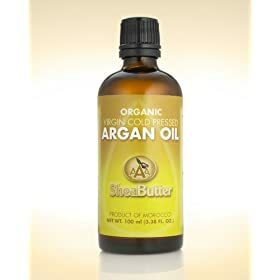 While surfing haircare blogs and beauty forums, I was constantly hit with Argan oil. I wanted to try it but was unable to find any in my local vitamin shoppe and health food store. At a recent event, I received a really great gift bag and what was inside- Argan Oil! I was super excited. So yesterday I ran a test to see how miraculous this Argan oil is, I am a major guinea pig. Before, I hit the salon for a major root awakening, I coated my scalp with it. Post fry and dye, my hair was extremely soft and didn't need anything on the scalp. The beautician even said it was supple. Argan has also been stated as being great for your face as well and I experimented on myself again. I supplemented Argan oil for my usual night cream. I was a little scared, back in '95 I read on article on Toni Braxton and she said she went to sleep with Vaseline every night. I tried it and woke up with what I believe is the world's largest pimple to date. So for me to switch up my night beauty routine was very scary. This morning, I woke up to a very fresh and blemish free complexion. I didn't look oily or puffy, my morning skin resembled my 10 am skin. Argan oil is far from pricey, just a little out of the way to purchase. Amazon.com carries it as well as a few other sites. The NY Times did an article about Argan in '07 and refereed to it as liquid gold. It's a great natural oil that has been used for thousands of years. I say give it a shot- natural products are making a comeback. P.S. Jack's World is carrying a bunch of great beauty products including L'oreal's H.I.P. line Bronzers, blush and lip glosses all for 1.99! I even scored a YSL lipstick!